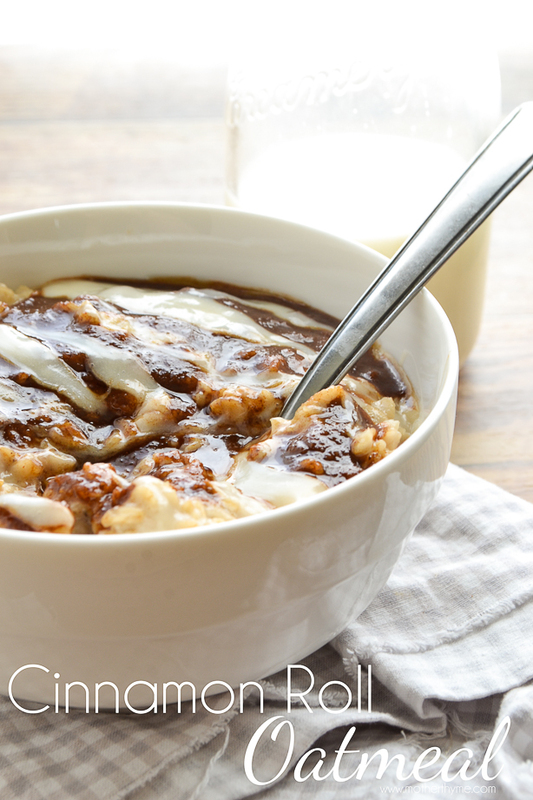 Start your morning with a warm bowl of Cinnamon Roll Oatmeal that is topped with cinnamon sugar and a cream cheese glaze. If you have followed me for the last few months it might be obviously that I love oatmeal. I shared my Pumpkin Pie Oatmeal in the fall, then came Cranberry Oatmeal. Now that the holiday decorations are tucked away for another year, so are my pumpkin and cranberry recipes until I start craving them again come fall. My latest creation of this Cinnamon Roll Oatmeal has been making a frequent appearance at our morning breakfast table and for good reason, it is so good. 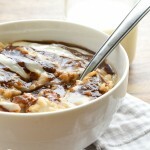 It has all the yummy flavors of a cinnamon roll mixed into a creamy oatmeal. Unlike other oatmeal recipes I have made and tried that mix all the ingredients in, for this I like to layer the flavors. Kind of like a cinnamon roll that is layered with the dough then rolled in cinnamon sugar and drizzled with a cream cheese glaze. I am totally craving a cinnamon roll right now. 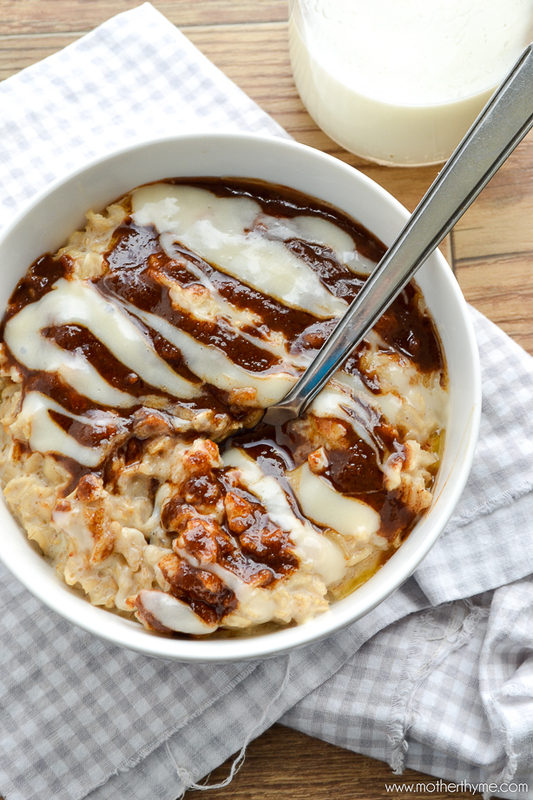 This Cinnamon Roll Oatmeal begins with a simple creamy oatmeal then is topped with all the goodness of cinnamon sugar and even a cream cheese glaze. 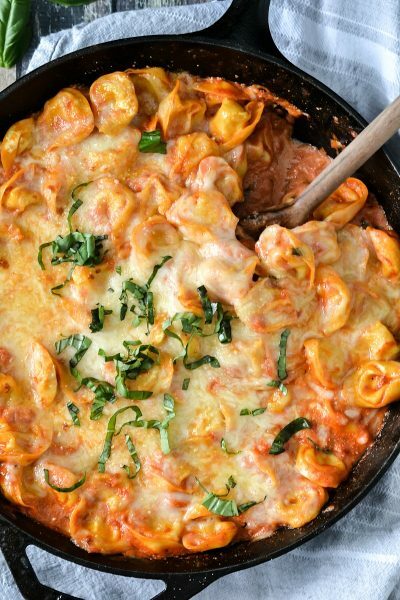 To save time in the morning you can assemble this the night before and reheat it in the morning. Once you dive your spoon into the bowl, you get all the flavors of a cinnamon roll in each delicious bite. In a large saucepan add milk, sugars, vanilla and salt and bring to a boil over medium heat. Stir in oats, return to a boil and continue to cook, stirring occasionally for 3-5 minutes until oatmeal begins to thicken. Cover and remove from heat. Let sit for about 3 minutes. In a small bowl mix butter, brown sugar and cinnamon until combined. Microwave cream cheese in a small bowl for about 10 seconds until just melted. Stir in confectioners' sugar until combined. Stir in milk and vanilla until creamy. Note: Add in a little more confectioners' sugar if glaze is too thin or a little more milk if glaze is too thick until desired consistency. Place desired amount of oatmeal in serving bowl. Drizzle with some of the cinnamon sugar topping and then drizzle on top of that some of the cream cheese glaze. Are you kidding me?! I’d totally eat my oatmeal everyday if it looked like this! I love your recipes but I won’t visit your site again. I have ad choice pop ups all over my computer since I got on this site. SORRY!!!!!!! This looks sooo good! Pinning for breakfast tomorrow! I think I finally found a way to get my kids to like oatmeal again, this look incredible! Total of 11 tablespoons of sugar?! Poor kids. 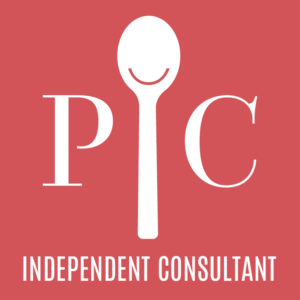 Thank you for your comment however my “poor kids” are very healthy and I usually substitute honey or agave nectar in their oatmeal in place of sugar.This recipe is meant to be a treat that can be enjoyed for a special occasion. You can adjust the sugar in this recipe to according to taste or use a variety of sugar substitutes in place of the amount of sugar indicated in the recipe. I think I’l have this for lunch-like now! And I’m hoping it is healthier than a cinnamon roll! I am NOT a morning person, but I think that for this oatmeal maybe I could give it my best shot. Worst comes to worst I can always eat it for lunch or dinner…or both. I mean it technically makes 2 servings haha. My husband and I absolutely loved this, but what made it great was that my 17 year old that hates oatmeal actually ate a whole bowl full. Wow,,, I am sharing this with all. Oatmeal to me is always bland. This looks anything but bland. Especially the glaze looks to die for, pinning! 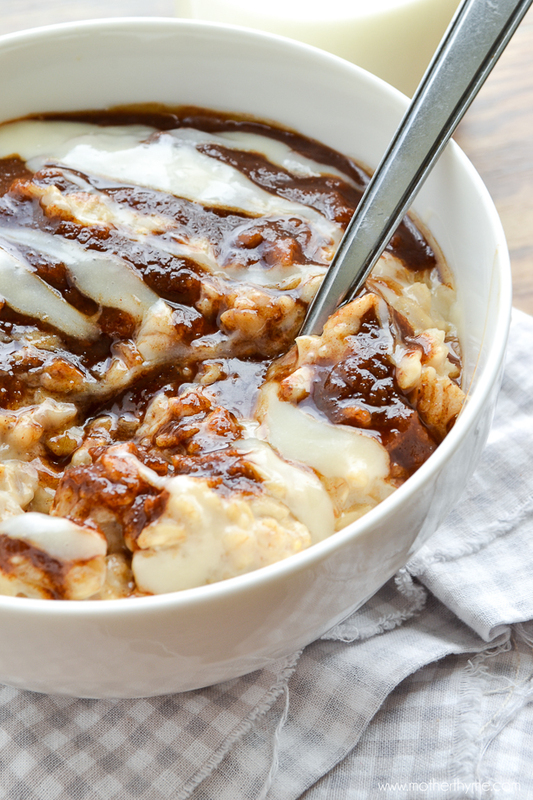 I so need to top my oatmeal with a cream cheese glaze, brilliant! I just made this with 7 grain cereal instead of oatmeal and added pecans. Just delicious! I’m so glad I decided to try this one! 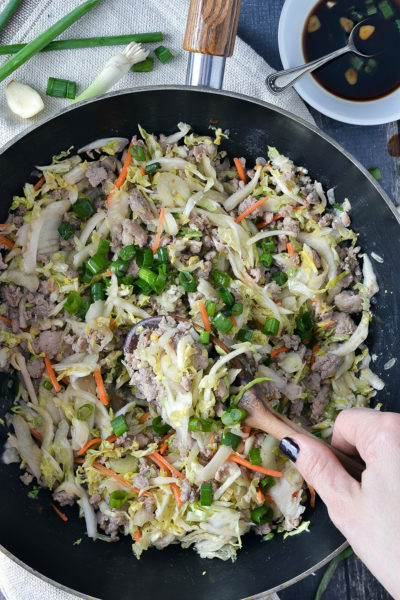 Love, love this great recipe! 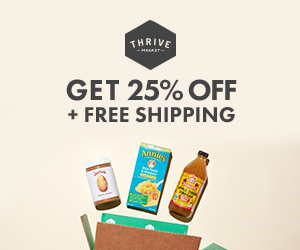 Can you share the nutritional facts? Need to know calorie count per serving. Thank you for sharing this great oatmeal!!! Hi Lynette, Sorry I don’t have the nutritional information for this recipe. I made this today for 3 kids that “hate” oatmeal and it was a hit. Then my oldest came home ate the leftovers and promptly requested it for tomorrow. I actually ended up using unsweetened vanilla almond milk (and skipped adding more vanilla)since we were almost out of regular. Love the idea of adding pecans! This is delicious. I try to make lots of different oat meal recipes for my husband and this is the one he has requested as a repeat. Thanks for sharing. Hi! 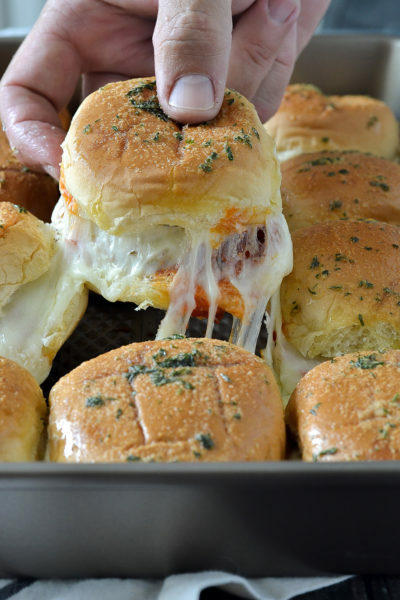 So happy to hear you enjoyed this recipe! I don’t understand why you have a food website if we can’t copy and paste the recipes. Isn’t the idea for us to try making what you’re posting? 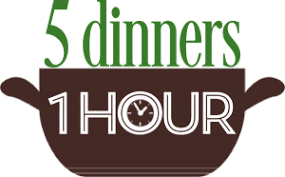 If I want to try a recipe on your site, I will have to write it all down, which just takes up too much time for someone who always picks something out at the last minute. I just don’t see how I can infringe on your rites by copy & pasting rather than writing. Michele, You can easily print the recipe hitting the print button above the recipe next to the title so you don’t have to write it down. Michele, I also forgot to add if you are trying to copy and paste the recipe, aside from printing it which I suggested before, once you hit print it will take you to the print version which you can easily copy and paste if you prefer. 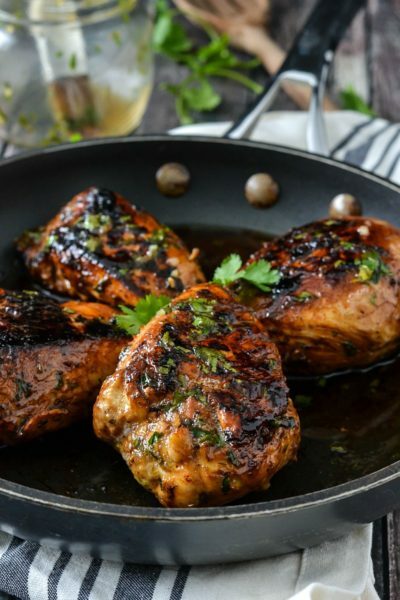 So glad to hear you enjoyed this yummy recipe! When I press the PRINT button, the recipe does print but NOT the photo. 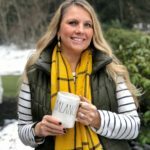 How do I print your recipe(s) & the photo(s) that go with the recipe? Any suggestions for me? Hi Donna, Sorry the photo didn’t print on the recipe. I have the settings for the print option without the photo since some readers have mentioned in the past that they wanted the recipe without the photo to save on ink. I will check to see if I can include the photo as an option for printing along with the recipe. Thanks for bringing this to my attention. Hi again Donna! I have added the images back to the recipe so when you hit the print button the image will also appear when you print the recipe. Enjoy! Jennifer, this looks too good to eat, but I would, and a second helping, too. YUM! Thanks for the awesome New Year’s breakfast recipe. It sounds lovely, but 11 tablespoons of sugar for two servings? Wow! Hi Kay, you can definitely reduce the sugar or use a sugar substitute to taste for your liking if you prefer. Enjoy! Looks great and sounds delicious-any idea of the nutritional information? Hi, I’m sorry I don’t have the nutritional information for this recipe. Wow, this oatmeal is fabulous! My husband and I had it for breakfast and couldn’t believe how much it tastes just like a cinnamon roll! Pinned and is now a favorite oatmeal recipe. I want some more right now! Thank you for sharing. I absolutely love this recipe. 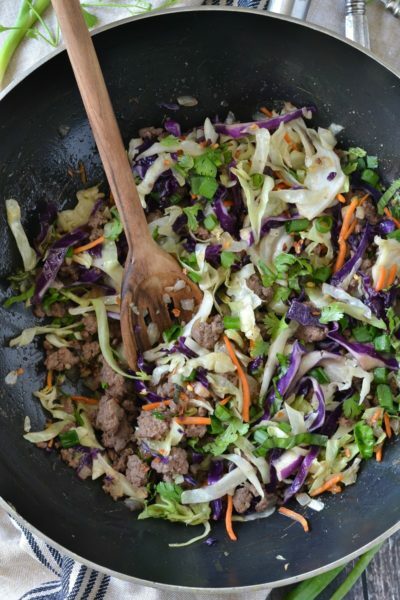 I’m making this right now but I’m using steel cut oats. So far I’ve had to add another whole recipe for the oatmeal because the originally amount of liquid was soaked up quickly. I’m excited to see how this comes out! 🙂 I will update when I’m done. This is VERY good but VERY sweet so not very healthy for breakfast/lunch unless you change for other sugar substitute of put less. I guess it would be more suitable for a snack or sugar/cinnamon craving. Hi Chantal, Thanks for your comment. Yes, this is totally decadent and should be reserved as an occasional treat. It can easily be adjusted with less sugar to your liking as well. This was super good, but definitely a treat! It’s very sweet, but a nice special breakfast option with fiber. 🙂 I made the glaze and the topping the night before and stuck them in the fridge. Then I Just had to reheat them the next morning. Made it a lot quicker on a busy weekend morning. I’m going to make it now, with the glaze! Then take it to work so that we get the full effect. We had this today for breakfast. It’s a snowy winter wonderland out there – and this oatmeal was the PERFECT foil. So rich and cinnamon-y. (is that a word?!?) It definitely made enough for two generous servings for two. Thanks for the recipe! This is a great recipe. Saying that, I did make a couple of changes. Cut the sugars way back and, just for something sort of different, add two strips of cooked, crumbled bacon. This oatmeal is by far the best ever! Yes I know it’s not the healthiest option out there but boy is it the most delicious! Crave a cinnamon roll? Make this. It’ll knock your socks off! Thanks for this amazing recipe. Love love love it!